Other products from JONTI-CRAFT INC. This easel is designed for smaller spaces or paper. It comes with a standard hardboard panel, and has optional acrylic, chalkboard and Write-n-Wipe panels. The maple frame is 46" high while the adjustable work panel measures 24" x 24". Awards: GREENGUARD indoor air quality certified. Other products from KIKKERLAND DESIGN INC. This environmentally friendly plastic stapler is designed to be kid-safe and comes in dog and cat versions. It eliminates the need for staples by cutting out tiny strips of paper and using the strips to stitch up to five pieces of paper together. The Rainbow Accents 2 Station Easel is designed to foster children's creativity. Write-n-Wipe easel panels come standard with this 25.5" x 20" x 46" easel unit; acrylic and chalkboard panels are optional. Clips and paint trays are included. The 24-count, beach-themed Sillybandz pack includes Message in a Bottle, Crabs, Palm Trees, Sail Boats, Surfers and Seashells. These bands are UV activated and change color under sunlight, and can be collected, worn, or traded with friends. Launch date: June 2010. — Diane Gervais, manager of Amato’s Toy & Hobby in Middletown, Conn., described Silly Bandz as “hotter than hot” in May 2010. — Mike DiAndrea, manager of Hardware Center Inc. in Paoli, Pa., told TDmonthly in late spring 2010 that his store sells 1,500 Silly Bands monthly. Other retailers from the 13 of 43 that named the product as an overall best seller, cited sales of anywhere from dozens to hundreds of packs per month. Each of these colorful erasers measures about 1.25" and resembles a fruit-filled jar of jam. The jam erasers are made in Japan and are sold separately or in a themed pack. Each of these colorful erasers measures about 1.25" and includes a removable pencil sharpener backpack. The teddybear erasers are made in Japan and are sold separately or in a themed pack. These tiny puzzle erasers feature cute cow faces and bright pastel accents. — In a June 2010 survey, three of 40 retailers told TDmonthly that Iwako erasers are a best-selling product. Available in pastels, these pig erasers are collectible and have removable puzzle parts. These small, dessert-themed erasers with removable parts are available as a group and in single packs. — Twelve percent of 43 specialty retailers named Iwako erasers as a best seller in May 2010. — Karlene Rearick, owner of The Alphabet Garden in Cheshire, Conn., told TDmonthly in spring 2010 that Japanese novelty erasers are their “top seller.” Owner Molly McMullin of Twirl in Ranchos de Taos, N.M., cited sales of at least 100 units a month. This easy to use three-in-one (Microscope, Telescope, and Magnifier) is ideal for the budding Spy or Scientist. Get bright, sharp images without blurry edges around the viewing area with these high quality optical lenses. This unique, slick, lightweight multi-use instrument is also great for sports fans, spy enthusiasts, or bird and animal watchers. Crush a soda can using only air pressure and other great air pressure experiments. Make your own petri dish and grow your very own bacteria. Test household acids and bases and make your own acid rain. Build your own electric magnet and other electricity experiments. View bugs up close with this device. The viewer allows you to observe your bug from the top or from the bottom. — This product is a best seller at Neely's in South L.A.
Other products from DIAPER DUDE, LLC. The Little D backpack is made of 100-percent polyester, with mesh lining and a PU black accent piece on the front flap. It includes an iPod holder, bottle holder and cell phone holder, along with two zipper pockets and one Velcro pocket. The backpack can also be used as a tote. It is "light weight, but still stylish and functional," Diaper Dude Administrative Assistant Stephanie Moore told TDmonthly. The Hydroponics Lab gives a 360 degree view of growing plants, revealing the hidden magic of plant roots with no soil required. This set of three growing tubes is a mess-free way to explore hydroponics. Transparent seed baskets provide a few seedlings growing both up and down. Other products from OPTIONS INC. These pens are carved from wood and painted in vibrant colors to depict a wide variety of fun animals. — “We carry a ton of different animals to choose from. It’s not your typical ink pen!” said Manager Katie Harris of Key West Toy Factory in Key West, Fla., of these best sellers in May 2010. The fronts of the 26 colorful cards from the Under the Sea set feature marine life illustrations from Janell Genovese. 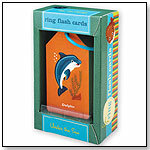 The backs of the cards include facts about the animals so kids can learn on the go. — Dee from Two of a kind, working on a full house found that within a week her son was remembering what he learned from the flash cards. She felt this would give him an advantage when he started preschool. From: PATHWAYS FOR LEARNING PRODUCTS INC.
Other products from PATHWAYS FOR LEARNING PRODUCTS INC. Developed by an occupational therapist, Pathquest aims to strengthen eye-hand coordination and visual perception through four different quests, with a total of 12 adventures. Developed by an occupational therapist to improve hand strength and coordination, these stenciling activities are designed to teach the young learner to find the proper shape among similar shapes to develop visual discrimination and visual form constancy. Children will also learn to place the shapes in the correct orientation in order to strengthen visual spatial relationship and closure skills. Working with the stencil encourages good hand strength and bilateral coordination. Snip It! is designed to help young children learn proper scissor skills. Snipping and cutting activities can help develop a child’s eye-hand coordination, adherence to visual boundaries and paper stabilization skills. Awards: 2010 NAPPA Gold. The pencil grasp trainer is designed to target and activate the proper muscles for writing. It's created for both left- and right-handed writers to improve handwriting and decrease hand fatigue. The patented ergonomic grip was designed and tested by an occupational therapist with finger guard and unique angles to place and hold fingers in the proper position. It is non toxic and latex free. Fun and practical, Tee Juice Broad Line markers let users make broad, bold strokes yet are soft to the touch. Kids can paint on fabric without the mess and hassle of paintbrushes and open bottles of paint. Teens can use these markers to express themselves by writing messages or drawing images on t-shirts. 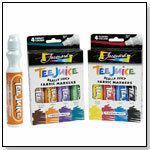 They are great for coloring in large blocks of color when using Fineliner or Medium Point Tee Juice Fabric Marking Pens. The markers come in eight colors, open stock and two boxed sets. This children's lunchbox combines style and function for kids, parents and the environment. Each Deluxe lunchbox includes a custom-fit ice pack, two small round containers suitable for sides and snacks, and one large container big enough to pack a whole sandwich or leftovers. Lunchbox handles are made of a soft rubber material and can be repositioned anywhere along the outside of the lunchbox to carry it vertically or horizontally, or clip it to a backpack. Each Yubo lunchbox is dishwasher-safe and comes with a designer faceplate set of two prints that can be swapped out for personalization. Faceplate sets are durable, water-proof, and tear-proof. Additional food containers and designer faceplate sets are sold separately. Cyndi Pedrazzi, Founder of Kinsco LLC, told TDmonthly, "Yubo's unique changeable faceplates allows kids to update the look of their lunchbox as often as they'd like. Kids can personalize faceplates with their name, upload photos or even their own artwork!" The adventure scenarios in this game are the actual journeys of such explorers as Marco Polo, Nansen, Scott, Drake and Cook. Players pick a journey, make preparations, assemble crews and venture forth together, each handling different aspects of the expedition. The package includes an 18" x 22" world map board, dice, a land and sea log of adventures, money, crew cards and assorted charts. Jim Deacove, president of Family Pastimes, told TDmonthly this product is "an educational eye-opener about the life of explorers — a good family and classroom game."